Labor Day to most people is a time to shop and barbeque, but it has a dark foundation. In 1894, Pullman employees went on strike to increase wages. President Grover Cleveland sent in federal troops to break the strike, and the riots became one of the bloodiest events in U.S. labor history with 30 deaths. Congress soon declared a federal Labor Day holiday. Oregon had been the first state to celebrate Labor Day as a holiday in 1887. Thirty states followed suit before the creation of the federal holiday in 1894. Holidays were hard won from 37,000 strikes in the last part of the 1800s and 800 killings of workers, mostly by state security forces or the military, between 1870 and 1914. Dictator Donald Trump (DDT) wants to “make America great again” by cheating workers. His Labor Secretary, Alexander Acosta, has shown great disdain for salaried workers, those who are not paid hourly, when he prepared to stop overtime for employees making over $23,660, a figure set by President Gerald Ford and never adjusted for inflation. The rule for overtime under $47,476 covers one-third of full-time salaried workers in the nation, far fewer than the 50 percent covered by Ford. Some people making just below the $47,476 got raises so that their employers wouldn’t need to pay the overtime; now employers can drop these salaries. Acosta called for public comments on the higher amount in July, the first step to eliminating it. Impacted by this change would be up to 12.5 million which includes 6.4 million women, 4.2 million parents (and, by extension, 7.3 million children), 1.5 million African Americans, 2.0 million Latinos and 4.5 million millennials. White people voting for DDT will suffer from this change. States supporting DDT tend to be poorer, places where salaried, white-collar workers are likely to earn below the $47,476 than in richer states. In West Virginia, the state with the worst economy in the nation, 30.7 percent of salaried workers will lose overtime pay if Acosta rescinds the rule. Other DDT states punished by the change include Arkansas, Georgia, Idaho, South Carolina, and Tennessee. The $47,476 amount represents the 40th percentile of salaries in the Southeast, the lowest-paying region in the United States. With the old rule, people making $24,000 without overtime are getting $6.60 an hour if their employee makes them work 70 hours a week. DDT is spending his first Labor Day in the White House after average working people put him there in an anti-establishment rage. On Election Day, the typical U.S. household was worth 14 percent less than in 1984. The wealthiest one percent owned more than the bottom 90 percent. Last year’s bonus for Wall Street was bigger than annual wages of all 3.3 million Americans working full time at the federal minimum wage of $7.25 an hour. The reason given for people now making less than their parents, having less economic security than their parents, the two-thirds who live paycheck to paycheck, and the widening gap in life expectancy between affluent and everyone else has been attributed to digital technology and globalization. But these problems have been paralleled by the shrinking of unions with only 6.4 percent of private sector workers in a union—a decline of almost two-thirds since the late 1970s. Top executives at big companies now make 300 times that of average workers, compared to only 20 times more in the 1980s. Workers in other advanced economies don’t face the economic problems in the U.S. Instead of having universal health care, affordable college, job retraining, public transportation, and higher taxes for the wealthy, however, U.S. workers kept dropping farther and farther behind. Seventy-six percent of the population think that government is operated by a few big interests, compared to the 60 percent of people in 1964 who thought government was “run for the benefit of all the people.” Then, most people said they had a “great deal of confidence” in the nation’s major companies, banks, and financial institutions; now only ten percent has that confidence. DDT makes the problem much worse with undermining health care, backing off from fair pay, and proposed tax cuts for big corporations and rich people. Across the country, the mis-named “right to work,” which prohibits union security agreements between companies and workers’ unions, is law in 29 states. Supporters of this law touts the “freedom” of workers to not join unions, but the law actually gives employers the “freedom” to pay lower wages and provide far fewer benefits. Any person who supports “right to work” should be asked how workers are better off. Workers in these states make $1,558 less than workers in a union state. Right to work was developed to keep low-paid Jim Crow labor in the South and fight what “Christians” saw as the Jewish conspiracy. Leader in the movement Vance Muse of the Christian American Association (CAA) was “a white supremacist, an anti-Semite, and a Communist-baiter, a man who beat on labor unions not on behalf of working people, as he said, but because he was paid to do so,” according to Muse’s grandson. On Labor Day 1941, Dallas Morning News editorial writer William Ruggles called for a constitutional amendment to block the closed, or union shop and came up with the name “right to work.” Ruggles joined forces with Muse, Texas lumberman John Henry Kirby, and Northern anti-New Deal industrialists and financiers, including Alfred P. Sloan and the du Pont brothers, using racist reasons to win. In Arkansas, the right-to-work campaign argued that without it, “white women and white men will be forced into organizations with black African apes . . . whom they will have to call ‘brother’ or lose their jobs.” In 1944, Arkansas and Florida became the first right-to-work states through rampant election fraud and the refusal to allow blacks to vote. In the 21st century, right wing activists are campaigning against progressive politicians by eliminating public sector unions. State Policy Network (SPN), with 66 state-based thinktanks in all 50 states, openly determine to remove funding from these unions under the guise of “labor reform” through an $80 million campaign against the 35-percent union membership in the public sector. Scott Walker’s Wisconsin took collective bargaining from public sector unions in 2010, and Iowa and Indiana followed its lead. Another 15 states have introduced SPN-written legislation. Michigan, long a union state, passed a right-to-work law in 2013. DDT has not been good for jobs, despite his campaign promises of 25 million jobs in ten years with 4 percent GDP growth. Candidate Trump also promised that he would produce 25 million jobs in 10 years with four percent GDP growth. Thus far, job growth since his inauguration is 15 percent below the same months for last year, and his GDP may be three percent although Hurricane Harvey may reduce it. Last week, he dropped his GDP estimate to three percent and halved job growth to “12 million new jobs.” Last week, before news of job growth lagging for the month of August, he went back on that promise by claiming that if he can sustain 3 percent growth it will result in “12 million new jobs.” During his two terms Bill Clinton created 21 million new jobs, and Barack Obama managed 14.1 million jobs starting with the year after the loss from George W. Bush’s recession. DDT celebrated his first Labor Day by firing 800,000 workers. He will end DACA, the program that grants work permits to undocumented workers brought to the U.S. involuntarily as children. Republican legislators have opposed this decision, and they now have a chance to reverse DDT’s destruction of millions of lives. To DDT, the undocumented people are garbage because they won’t be voting for him in 2020. Sixty percent of people in the U.S. view unions favorably, a 25 percent increase since 2015. What have unions done for people in the United States? They fought against child labor, discrimination in hiring, and sweatshops. They strengthened public education and founded Social Security and Medicare. They built the nation’s infrastructure of highways and bridges and airports. Unions fought for 40-hour work week, worker safety, paid vacation time, health and retirement benefits, sick leave, overtime pay, sick leave, right to breaks, minimum wage, workers’ compensation, higher wages, and more. If you have any of these benefits, thank a union. If you don’t, thank DDT and the GOP. Labor Day, the first Monday in September, became a “holiday” 122 years ago in 1894, a few days after government killed 30 striking workers in Chicago. Labor unions slowly developed in the decades before Labor Day but didn’t rapidly grow until the Great Depression and the New Deal of the 1930s. By the 1950s, unions had begun to achieve its goal of the 40-hour workweek, overtime pay, minimum wage, safer workplaces, Social Security, and the prevention of child labor. Medicare was added in the 1960s. Unions were responsible for the growth of a healthy middle class that provided a strong infrastructure, public services, and educational system. Republican presidents and leadership from 1968 through 1992 led to the decline of union and the stagnation of wages. A half century ago, almost one-third of U.S. workers belonged to a union; now it’s below ten percent and would be far less if it weren’t for the 35 percent of government workers who belong to unions. The refusal of the South, always the most impoverished region of the U.S., kept the percentage of union membership down. Even at the peak of unions during the 1960s, the South had only half the share of union workers as in the Northeast, Midwest, and West. During the past few decades the economy in the nation has grown to double what it was in the late 1970s. In contrast to the late 1940s when income went up for everyone in the United States, 90 percent of workers earn about the same now as in the early 70s with the top ten percent seeing a sharp rise in real incomes. People in the top ten percent turned their wealth into power used to break labor unions, halve the taxes that they pay, eliminate safety nets, deregulate Wall Street, and increase costs. George W. Bush’s recession made the income inequality worse as shown by this graphic. As the U.S. comes close to the end of President Obama’s last term, there are glimmers of hope for the 90 percent. A Gallup Poll, usually very conservative, indicates that 50 percent of the people think that they are better off than eight years ago. The percentage of people—across all ethnic groups—who say they are “thriving,” 55.4 percent, is over double that of people in 2008. Donald Trump’s pitch to get votes from black voters is “what do you have to lose.” Many blacks respond with losses of civil rights, employment, income, and education under a Trump presidency. Since 2010, businesses have added 15.1 million jobs, and that time period is the longest streak of total job growth on record. The unemployment rate has been cut in half since Bush’s recession. President Obama has finished the Fair Pay & Safe Workplaces Executive Order to hold accountable the federal contractors who repeatedly violate worker safety and labor laws. One in five U.S. workers are employed by these contractors. The Labor Department extended overtime protections to 12.5 million additional workers by increasing the overtime salary threshold $47,476. Graduate students at private universities may now unionize. Unions are often defeated by business because employers have almost unrestricted union-busting. The Labor Department has closed a loophole, created in 1959, that allowed businesses to hire anti-union consultants, “persuaders,” without reporting this practice. When union membership falls, wages fall for everyone. The 32.9 million full-time nonunion private-sector women and 40.2 million full-time private-sector men suffered a $133 billion loss in annual wages because of weakened unions. If unions were as strong in 2016 as they were in 1979, nonunion men with a high school diploma would earn an average of $3,016 more a year. Workers in unions earn, on average, 27 percent more than their nonunion counterparts. Unions close the pay gap for women, and black workers see outsized gains from union representation. At the same time while unions have declined, the pay gap between CEOs and workers has gone from 20:1 in 1965 to up to 331:1 today. President Eisenhower bragged about unions in the 1950s, but every GOP president since then has been anti-union. Donald Trump pointed out that the economy is better with Democratic presidents in 2004 and said that Hillary Clinton would make a good president. He repeated the same thing in a recent interview, omitting the part about Clinton. Now the GOP is pushing the myth of the “sharing economy.” People are forced to rent out rooms in their homes or drive their own cars for pay in the new “Uber” philosophy. Conservatives blame poor people on their moral failure. On this Labor Day, plan ahead. Vote for people who support unions and a strong middle class. Trump Watch: Donald Trump is definitely not in favor of unions. He blocks them in his businesses and refuses to pay overtime and some of his contractors although he signed contracts with them. Approached the about the fine for his illegal foundation contribution to Florida AG Pam Bondi, Donald Trump repeated several times that he had never spoken to her. Marc Reichelderfer, Bondi’s reelection consultant, had said in June that Bondi personally asked for the donation. Later he indicated that he didn’t talk to Bondi about dropping the fraud investigation against Trump University. She dropped the case after she got $25,000 from the Trump Foundation. Asked if he would definitely debate, Trump said, “As of this moment, yeah.” He added that only “hurricanes and natural disasters” would stop him from debating Hillary Clinton. Trump commended that he had done the other debates, forgetting that he had skipped one of the GOP debates and backed out of one when he challenged Bernie Sanders. Trump also declined to say whether he believes President Obama was born in the United States. “I don’t talk about it,” he said. Despite his desperate attempt to woo black voters, he has never apologized for his birther campaign or said he believes in the legitimacy of President Obama’s birth certificate. Saudi Arabia was another issue on which Trump keeps changing his mind. He slammed Hillary Clinton for taking money from Saudi Arabia for the charitable Clinton Foundation, but it was recently discovered that he has made millions of dollars from that country which bought the 45th floor of Trump World Tower for $4.5 million. Since 2001 he has been paid $85,585 a year for building amenities. Osama Bin Laden’s half brother also lived in the Tower for four months in 1986. Trump recently told Sean Hannity that he would not take money from the Saudis, but last year he bragged that Saudi Arabia spends “$40 million, $50 million” for his apartments. “I like them very much,” Trump said. After endorsing the GOP presidential candidate for the past 9 elections, Virginia’s Richmond Times-Dispatch has endorsed Libertarian candidate Gary Johnson Saturday. Sen. Jeff Flake (R-AZ) said that Donald Trump’s candidacy might turn Arizona blue in this election. Hillary Clinton is ahead in the polls on Labor Day. History shows that the losing presidential candidate at that time is the losing candidate in November. We can only hope, but we’ll make that decision nine weeks from tomorrow. People have not magically received the following benefits from gracious employers. People fought and lost jobs to get these advantages for employees. These are benefits that people in the United States are gradually losing because conservatives want to give everything to the wealthy and to the corporations. Corporations use to work employees 80+ hours a week, offer no breaks, hire children, offer horrid, unsanitary work conditions, paid literally next to nothing, and even murder them with unsafe working conditions. Conservatives who believe that union supporters are thugs need to give up all these benefits. Or they can support unions before the middle class sinks farther into the mire. Gov. Scott Walker has created a new category of “takers” in his state of Wisconsin. Opposed to people getting something for free, he has signed the misnamed “right to work” law that allows people not to join the unions at their places of employment. To some people, this is “freedom,” but unions are not free to protect and negotiate for only their members. They must do this for all workers in places that unions cover. That means employees who don’t join unions but still benefit from the hard work of the organization are actually taking something free from the people who do pay for these services. The law makes Wisconsin the 25th “right-to-work state” and the first state since Michigan and Indiana in 2012. The American Legislative Exchange Council (ALEC) provided wording, also used by Wisconsin, for this bill and those being pushed through legislatures in other states. The takers of Wisconsin are funded by ALEC backers such as the Koch brothers, the Coors family, and Exxon Mobile. This law follows Walker’s stripping collective-bargaining rights from many state workers in Wisconsin. Although the ALEC-worded RTW bill may succeed in Missouri, it has run into problems in Montana, Colorado, West Virginia, New Mexico, Kentucky, and New Hampshire—at least for now. Michigan has introduced a RTW extension for police, fire, and public safety unions. Kentucky is passing RTW on the local level, and billionaire GOP Gov. Bruce Rauner has issued an executive order for RTW in Illinois public unions. On the federal level, Sens. Rand Paul (R-KY) and Mitch McConnell (R-KY) introduced a “National Right-to-Work Act,” and Rep. Steve King (R-IA) introduced its companion act in the House. Walker said, “This [law] sends a powerful message across the country and across the world.” His message is his move to the right as he prepares for a presidential campaign. His email message immediately after he signed the bill is that he wanted money for his campaign when he asked for donations of $10, $100 and $1,000. Walker consistently reneges on his statements. Until a few weeks ago, he denied that he would make Wisconsin a RTW state and claimed throughout his reelection campaign, “Private-sector unions are my partner in economic development.” Before his 2010 election, he told newspapers that he would negotiate with public sector unions; his anti-collective bargaining bill was introduced immediately after he took office in 2011. Two years ago, he was in favor of giving undocumented workers a chance at citizenship if they obeyed the law. Now he reversed that opinion to join another possible presidential candidate, Sen. Ted Cruz (R-TX). The governor’s position on abortion has also reversed. Before last fall’s election, he told voters, “I support legislation to increase safety and to provide more information for a woman considering her options.” He claimed he supported a bill that “leaves the final decision to a woman and her doctor.” Now he plans to sign a bill banning abortions after 20 weeks in constitutional violation of Roe v.Wade and removing the decision from a woman and her doctor. Wooing Iowa, he switched his opposition to mandating ethanol and other renewable fuels. Now he wants to continue the Renewable Fuel Standard. Iowans might want to use caution in believing him. Walker will no doubt flip his promises for any personal gain. ALEC has been helped by the 60-year-old National Right to Work Committee (NRTWC), led by fundamentalist Christian Greg Mourad, that also receives huge donations from the Koch brothers. The organization was co-founded by right-winger Fred A. Hartley, who co-sponsored the 1947 Taft-Hartley Act restricting unions and also co-founded the John Birch Society. The NRTWC has been behind the skyrocketing income inequality in the United States. CEOs who earned 20 times a worker’s pay 50 years ago, now receive at least 300 times the worker’s pay. Between 1973 and 2014, public-sector union membership dropped by 78 percent. Unionization and minimum wages helped equalize the distribution of wages. That’s why the Koch brothers are determined to get rid of both. In a comparison of the share of income going to the middle 60 percent of population, the workers in the ten states with the lowest rates of union membership brought home 46.8 percent of total income, and the ten states with the highest rates of union membership brought home 47.4 percent of total income. It may sound like a small percentage, but the difference is equivalent to billions of dollars. Abdur Chowdhury, professor of economics at Marquette University in Milwaukee, explained why Walker’s legislation could annually cost Wisconsin $4.5 billion in lost income and revenue: “If our income goes down, we spend less money on groceries.” Walker also loses money for his state: less income means less tax revenue, at least $234 million. The state won’t get this back from the wealthy and corporations because of the massive tax cuts that Walker gave them. Despite claims from ALEC “economists” that RTW laws boost per capita personal income, average wages for all occupations in RTW states were about $4 an hour lower compared to non-RTW states in 2013. In RTW states, workers have $5,971 lower wages and fewer employers offering pension benefits or health care. Employers looking for skilled workers or a well-developed infrastructure will most likely not go to RTW states because these are less likely to have these advantages. That’s a reason that 400 businesses formed a coalition to oppose the law. Oklahoma, the first state to pass a RTW law in 2001 for 25 years, was also the first state to do so in the post-NAFTA era of globalization. There has been no positive impact on employment in Oklahoma in the last 14 years. In addition, the number of companies relocating to the state and the number of manufacturing jobs both fell by a third in the first decade after the law was enacted. Walker is not finished with trying to lower wages for workers. He’s trying to restrict the role of administrative law judges in workers comp disputes and take authority for the system away from the state Department of Workforce Development, a move that has been found unconstitutional in Florida. Also, Wisconsin is one of 32 states with a wage law to “prevent lowball bids from depressing wages,” something that Walker wants to repeal. The third reduction of wages would come from prohibiting “project labor agreements” that bars non-union contractors from working on publicly-funded projects. Unions in Wisconsin are fighting Walker in creating his new category of takers. The Wisconsin state AFL-CIO with chapters from the International Association of Machinists, and United Steelworkers unions have filed a suit on the basis that the law “deprives the unions of their property without just compensation by prohibiting the unions from charging non-members who refuse to pay for representative services which unions continue to be obligated to provide.” In other words, Walker’s permission for employees to free-load off the unions is unconstitutional. When Walker was elected, he promised a massive increase in jobs in his state. He failed. Since Walker became governor, job growth, GDP, and decline of unemployment have all lagged behind neighboring states and the nation as a whole. He may fail again with his new RTW law. Seven of the 10 states with the highest unemployment rates are RTW. After stopping RTW laws in 2012, Minnesota’s average weekly wage is $877.81, almost ten percent higher than its RTW neighbor Michigan that has a 6.3 percent unemployment rate compared to Minnesota’s 3.6 percent. Indiana, another RTW state, has an average weekly wage of $788.70 and a 5.8 percent unemployment state. Minnesota is one of the five fastest-growing states in the nation since 2012. RTW Michigan also has a huge budget deficit and no industry coming into the state. Gov. Rick Snyder has had to lower the number of jobs that businesses need to create in order to receive massive tax credits. The worst is yet to come because workers are still operating on contracts made before the 2012 law, something that won’t happen in Wisconsin because the law goes into effect immediately. Quality of life in RTW states is measurably worse with eight of the worst states in the nation having RTW laws, and eight of the best being non-RTW. RTW states have poorer life expectancy and infant mortality, higher homicide rates, worse pollution, lower voter turnout, less broadband access, lower educational levels, and poorer housing. The 24 RTW states have 34 percent higher rate of deaths on the job in the construction industry. During the 20th century, the middle class grew as unions grew; it began to shrink when unions were weakened through the so-called “right-to-work” laws. Walker’s legacy will be the bodies that he leaves strewn along his path toward the White House. The possibility of an increase in minimum wages has attracted the ire of many conservatives in the United States. President Obama was threatened with lawsuit after he issued an executive order that employers with federal contracts would be required to pay a minimum of $10.10 per hour. While the federal government refuses to act, however, other places have taken action. In the most recent election, five states—four of them considered red—approved raises to the minimum wage. In addition to Alaska, Arkansas, Illinois, Nebraska, and South Dakota, counties in Wisconsin and two California cities, San Francisco and Oakland, passed ballot proposals to increase the wage. Employee protests throughout the country are also demanding $15 per hour. Last September, more than 400 people were arrested in nonviolence civil disobedience in 150 cities. The pittance that wealthy corporations pay their employees is egregious, but it doesn’t match the practice of some employers—that employees sign a mandatory non-compete agreement to be hired. Traditionally this action has been used for CEOs or people with highly specialized skills and knowledge. The purpose of a non-compete clause is to keep the employee from taking confidential knowledge or trade secrets to another business for a specific length of time. Some states ban non-compete clauses, but in other states, businesses are demanding these for minimum-wage employees. If you get a sandwich at one of the 2,000 Jimmy John’s sub sandwich restaurants, your server may have a non-compete clause, as does the person who made the sandwich. Top executives can negotiate their non-compete clause in a contract; a minimum-wage worker is so desperate to get a job that they have to agree. Fired top executors are likely to be paid for the time of the clause; fired minimum-wage workers are out on the streets without any right to get a similar job. The area in which employees could not work covers 6,000 square miles in 44 states and the District of Columbia. For example, a student who worked at a Jimmy John’s in Illinois during high school could not work almost anywhere in Tuscaloosa serving sandwiches—including a school cafeteria–when he attended the University of Alabama. One reason for the non-compete clause would be to prevent any dissent among workers who would be less likely to attempt to unionize if they knew they could not get another job after being fired. For example, Erik Forman and five other workers were fired from a Minneapolis Jimmy John’s over three years ago for trying to unionize their store. Originally the workers brought lawsuits claiming that the company forced employees to work off the clock but amended the suit to argue that the non-compete agreement is overly broad and “oppressive” to employees. One of the employees forced to sign the agreement was an assistant store manager, the other a delivery driver and assistant store manager. Forman, who graduated from Macalester College, couldn’t find a job while the case was being appealed. 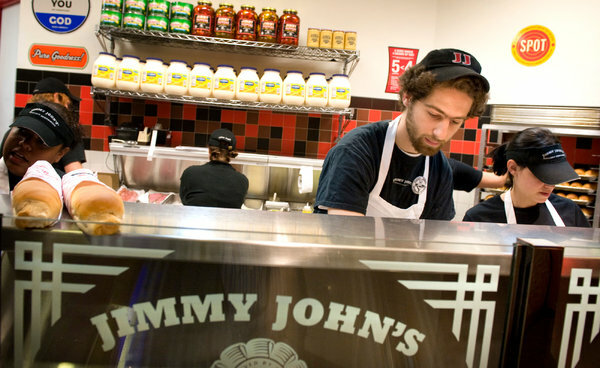 Another fired worker, a graduate of the University of Minnesota, went ten months without a job after he was fired from Jimmy John’s, where he made $7.50 an hour, before he found another low-paying job in the retail industry. The issue for creating a union was the company’s sick-day policy. Workers were required to find their own replacements if they called in sick, and they didn’t get paid for the time. If they couldn’t find anyone to fill in, the company assigned them demerits. A former Subway manager has accused her earlier employer of trying to block her from starting a new job at another sandwich shop. The woman signed an agreement in 2009. In Bellevue (WA), Benny Almeida faced the same issue when, desperate to get a job, he took a $15 an hour position as a water-damage cleanup helper. Three months after he started with ServiceMaster of Seattle, he was offered a job with another firm for $18. The non-compete agreement that he had signed covered King, Snohomish, Island, Yakima, and Kittitias counties—a rather large area. The clause meant that he also was prevented from working for two years in any water- or fire-damage job, janitorial, office cleaning, window washing, floor or carpet cleaning or other job ServiceMaster does. ServiceMaster said the clause was for the training, but Almeida said he didn’t get any. He thought the clause applied to managers high enough to have client lists or leave to start competing businesses. The non-compete clause is just one way in which employers abuse their employees. Workers at an Amazon warehouse in Nevada aren’t paid for the time that they wait to be screened at the end of their workdays while the company makes sure they have not stolen any goods. FedEx workers are “independent contractors,” according to the company, and therefore don’t have benefits, reimbursements of incurred costs, and overtime. Retail workers are assigned inconvenient schedules that change at the last minute, meaning that they cannot make any plans including college classes. They can even be sent home if sales are slow but have no right to deal with family members who become ill. The entire issue boils down to questions of ethics and economics. Big business claims that they can’t afford to treat employees on a higher level than medieval serfs, but a few large companies, including Costco, Whole Foods, and In-N-Out Burger, have found that treating their employees like human beings has been good business. Unfortunately for Jimmy John’s, negative publicity has brought to light the ridiculous practice of non-compete agreements for poorly-paid employees. Thirty-seven congressional members are requesting an investigation by the Federal Trade Commission and the Department of Labor. One element that courts examine in determining the validity of a non-compete agreement is whether it is necessary to protect the employer’s legitimate business interests instead of merely restricting the worker’s ability to find another job. A recent Kentucky Supreme Court ruling in Creech, Inc. v. Brown ruled that continued employment with no other reasons is insufficient to justify the agreement. Big corporations may lose their ability to use this unreasonable method of control over employees. Those who object to Jimmy John’s non-compete agreement may want to sign a petition opposing the requirement for workers.